A drug addict who armed himself with a syringe before trying to rob a coffee shop in Halifax has been jailed for 30 months. The attempted hold-up at the Caffe Nero premises in Southgate came just four days after Elland man Michael Farrer had been let out of prison. Last year Farrer had been jailed for threatening a Tesco employee with a syringe during a shoplifting incident. 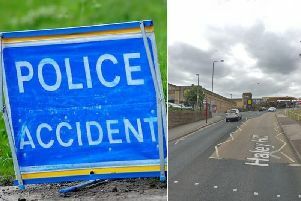 Bradford Crown Court heard how the 28-year-old, of Dean Street, carried out the early morning attack in the hope of being arrested and taken back into custody. Prosecutor Abigail Langford described how Caffe Nero worker Joanna Cooper had been working at the premises when Farrer came in at about 6.30am. Initially Farrer asked about a phone charger, but after leaving the shop he came back in with the syringe in his hand. The complainant feared that she would be stabbed with the syringe when Farrer demanded money from the till even though there was not yet any cash in it. The attempted robbery last October was captured on CCTV and Farrer admitted the offence at a previous court hearing. Farrer’s barrister Ian Howard conceded that his client had “an unenviable record” of offences, but he pointed out that the defendant’s guilty pleas to the charges of attempted robbery and possessing an article with a blade or point had spared the complainant having to give evidence in court. “He had bought the hypodermic syringe with the intention of bringing about a state of affairs whereby he would be arrested and remanded into custody,” said Mr Howard. He said if Farrer had got cash from the shop he would have injected drugs before handing himself in to the police. Judge David Hatton QC said Farrer had threatened a woman who was going about her employment and she had feared that she would be stabbed. “The offence is aggravated by the fact that you had last year committed a very similar offence, threatening somebody with a syringe in your quest for money, and it is also aggravated by the fact that you had only been released from prison four days previously,” the judge told Farrer. The judge said he had not choice but to impose a jail sentence of 30 months after giving Farrer a 25 per cent discount for his guilty pleas.